manage waypoints and create tasks. Enjoy analysing flights and prepare for the next ! Replay your flights in 3D in your browser window. There is no such thing as "to much information" when we are analysing our flights. Parameters as average climbrate, speed and LD can be compared over multiple flights. An IGCviewer made by Alistair Malcolm Green and Richard Brisbourne which was a true inspiration and shows the potential of reviewing IGC files in a browser window. Cesium created an awesome 3D globe and environement. 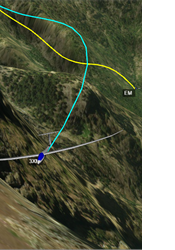 It's a real joy to review our flights in the Cesium viewer. Google Maps are well known to most users, these maps are very clear and complete so they deliver the perfect background for an overview of our flights. 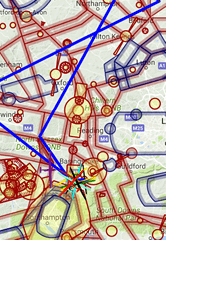 OpenAIP is another great opensource project that delivers airspace and airportlayers. We use a very straightforward approach to implement the RASP Weathercharts. Just switch-on the Blipmaps(BM) layer and select the chart. Zoom out to see the full result. Charronizer allows flemish pilots to load their flights from Charronline by simply selecting the flightdate.